Virginia jurors will see segregationist memorials & Confederate tributes outside many courthouses | Jon Katz, P.C. 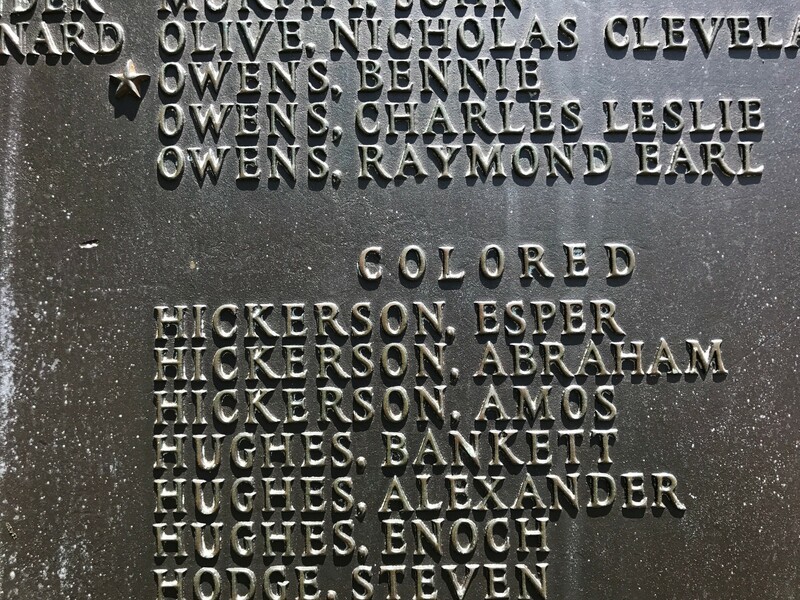 Racially Segregated WWI memorial at King George County, Virginia, Courthouse. See the entire memorial here. The Civil War lives on very much in Virginia, with civil war memorials that by law may not be moved nor dismantled (Virginia Code § 15.2-1812); Richmond’s numerous statues of Confederate soldiers, barely offset by African-America Arthur Ashe’s statue far away; [Robert E.] Lee Highway (Route 29) and Jefferson-Davis Highway (Route 1) starting in Arlington; the annual Lee-Jackson Day that precedes Martin Luther King, Jr., Day, and closes state offices and courts; and the many Virginians who proudly fly the Confederate flag at their homes, sell the flags at their shops, and attach them to their vehicles. My family and I rarely can travel more than 100 miles south of our home in Fairfax County — if even that far — without seeing Confederate flags on display, which is the displayers’ First Amendment right that I am ready to defend as a lawyer if encroached, while holding my nose at the display. I chose to move from New England, where I grew up and attended college; to Manhattan, where I worked for a year before law school; to Northern Virginia, near my law school in neighboring Washington, D.C. All these Confederate tributes and Confederate flag displays never justified my choosing to live elsewhere, nor for me to ignore nor be silent about the situation. I grew up in the North, which itself was no bastion of sufficiently widespread racial enlightenment, either. The N-word and other bigoted words towards African Americans, Jewish people, Iranians (after the Ayatollah Khomeini took power), and the list goes on, flowed effortlessly from so many people wherever I went in the North — including at workplaces — from Fairfield/Bridgeport, Connecticut, to Boston, to New York City. I located my home and office in Fairfax, Virginia, because the vast majority of my clients’ court cases are in Northern Virginia. I like where I live. The Washington, D.C., area is one of the major five metropolitan areas in the nation and is the least populated and polluted of them all. The ethnic and international mix of people and culture is great. The hiking and other outdoor opportunities are terrific. Many great performances and other events come this way. Various non-racial defenses are offered by those supporting displays of Confederate memorials and flags, including that this is not necessarily about slavery, history cannot be ignored, bravery of soldiers must be honored, there were black people fighting among the Confederate soldiers, and the North’s victory in the Civil War does not equate with giving up pride in Virginian and Southern history. The Civil War — also known as the War Between the States — has also been called the War of Northern Aggression, even though the first bullet apparently was fired by the South Carolina army at the federally-occupied Fort Sumter. Then again, plenty of battles have not erupted into full-scale war. The debates have gone on over the generations about the extent to which the Civil War was over slavery more than states rights or vice versa. At the same time, without slavery in the South, the South never would have seceded in the first place. This is a legal blog, and my main concerns as a lawyer is about the message that is sent to jurors and litigants who enter the slew of courthouses in the Commonwealth that have various statues and memorials paying tribute to the Confederacy, and to World War I memorials (at least in King George and Lynchburg (named for John Lynch, whose name may have contributed to the word “lynching” and “who allegedly slew outlaws and runaway slaves in the Tidewater’s Dismal Swamp area”) Counties that racially segregate the names of white and “colored” American soldiers who resided in their respective counties. 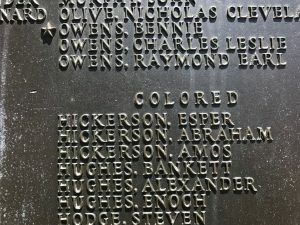 One mile up the road from the Arlington County courthouse in northern Virginia, a war memorial separately lists white and “colored” soldiers who died in WWI. I have written before about my discomfort about entering courthouses that have tributes to the Confederacy. My continued objection to these courthouse memorials is like peeling layers of an onion as I find additional discomforting layers. 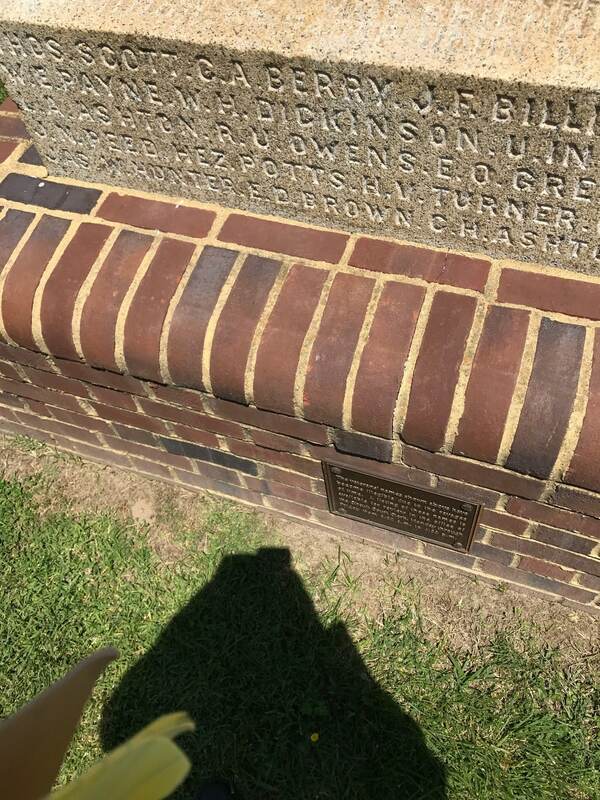 I write this blogpost after my recent discovery in front of the King George County, Virginia, courthouse — after concluding my case there with a great result — of a World War I memorial that racially segregates the names of the county’s soldiers who served in that war. Before then, I had not known about such racial segregation in memorializing soldiers. Betty McGuire Smoot donated the segregated World War I tribute outside the King George courthouse, via the American Legion in 1935. These soldiers risked and lost their lives at war, all bleeding red blood, but returning to virulent racism and racial segregation. 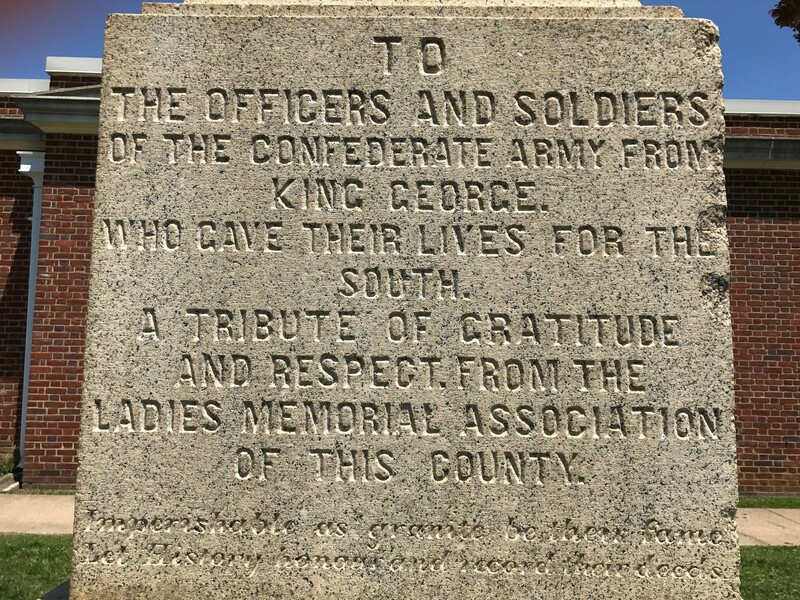 A few feet from this segregated World War I tribute is a memorial to the King George County Confederate soldiers. At the base is a later-added plaque that mentions the illegibility of some names — due to erosion over time — and invites people to check with the Circuit Court Clerk for the honorees’ names. That changes the situation from the courthouse yard as a space for memorials, to making the court system a closer participant than that in the situation. The court should not make such an offer without making a clear stand for the necessity of a color-blind justice system, when considering the courtyard’s memorial with a segregated white and “colored” listing of WWI soldiers, this tribute to Confederate soldiers and the District Courtroom portraits that include a Civil War soldier, a judge who was of age during the Confederacy, and a judge sitting 1964-81, meaning the period that saw the U.S. Supreme Court in 1966 outlaw banning racial intermarriage, in Loving v. Virginia. In southwest Virginia alone are a slew of Confederate memorials. The Loudoun County government’s website includes a high school intern’s report on the history of the old courthouse that is but feet from the new one, saying: “In front of the courthouse stands a statue of a Confederate soldier. It was designed by F.S. Sievers, and dedicated to the courthouse in 1908. 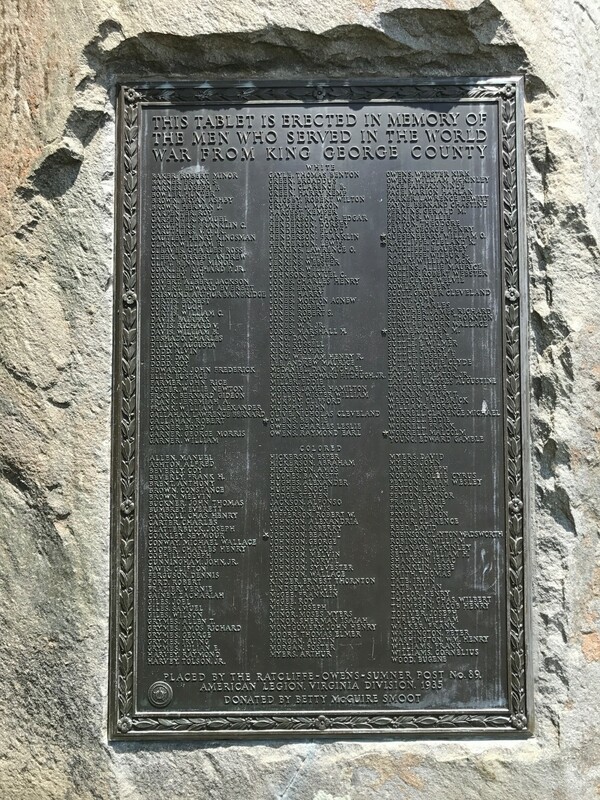 It serves as a memorial to the many Rebel soldiers who died fighting for the cause in which they believed.” Yes, Virginia Code § 15.2-1812 bars moving these memorials (but efforts have been made recently to change that), but people cannot hide behind this statute that needs to be changed accordingly. Fortunately, the stocks and whipping posts removed from the Loudoun County courthouse grounds in the 1980’s did not qualify as war memorials not subject to removal. Alexandria, Virginia’s city council in 2016 actually pushed to remove the prominently-placed Appomattox soldier statue, but that effort never made it to the state legislature, which would have had to approve the move. The city council did in 2016 approve changing the name of Jefferson-Davis Highway (named for Route 1), but apparently only if neighboring Arlington County agrees to go along, which for Arlington requires General Assembly approval. Municipalities will have fiscal considerations when pursuing the removal of certain Confederate Monuments, as Charlottesville learned with a price estimate of several hundred thousand dollars to remove statues of Robert E. Lee and Stonewall Jackson. Earlier this year, the Charlottesville City Council voted 3-2 to remove the Robert E. Lee statue. We have come a long way towards a more color-blind society, but not far enough. Even after I was born in 1963, interracial marriage remained a felony in Virginia until the Supreme Court solved that in 1966, and volunteer firemen in Leesburg reacted to a 1966 court ruling opening the Volunteer Fire Department’s swimming pool to all races, by filling in the pool with cement. People with these racist and segregationist sentiments still walk the earth and are potential jurors. Even as seemingly charming and funny a man as the late Virginia Chief Justice Harry L. Carrico blundered in penning the Virginia Supreme Court opinion declining to overturn the law criminalizing interracial marriage, only to have the United States Supreme Court unanimously reverse him. Consequently, if these Confederate and racially segregated courthouse memorials are to remain, they need to be sufficiently offset by tributes to such civil rights champions as Martin Luther King, Jr., and messages about the need for color-blind justice, lest jurors think these memorials greenlight race-based verdicts, and lest non-white litigants think they will get less justice because of their skin color.